Sushi - Maki Rolls filled with black sesame seeds, avocado and carrot, with wasabi, soy sauce and pickled ginger. Oh, and champagne of course! Amaretto Spiked Chocolate Mousse for dessert. Coffee and chocolate dipped fruits for after. 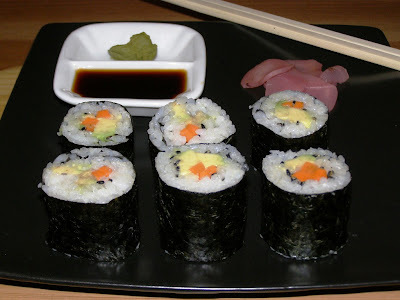 Our 8th anniversary yesterday and I made maki rolls - surprisingly easy and so, so good, the wasabi essential - really makes the dish, just take a tiny amount and mix it into the soy sauce for dipping. 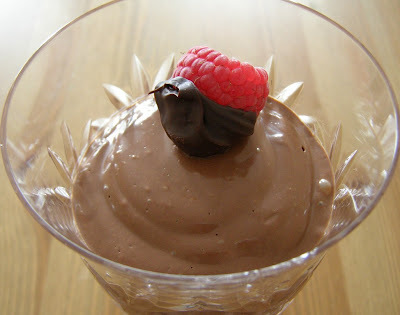 The mousse recipe is from Heidi's fab blog again. It's perfect, I tried to take a picture of the texture but it didn't do it justice, it comes out really mousse like, slightly more pudding/mousse than traditional mousse but I like this better - and no raw egg!! Plus you've got to love a dessert were you get a daily serving of protein. Serves 2 as a main course, halve to serve 2 as a snack. Makes 12 small rolls in total. Place the rice and water in a saucepan and put lid on. Bring to the boil, reduce heat and simmer for 10 minutes. Do not lift the lid! Turn off heat and let sit for 15 minutes, again, do not lift lid. Whisk together the rice vinegar, mirin, sugar and salt until all dissolved. Tip rice into a large bowl and slowly pour dressing over then use a rubber spatula and fold the dressing in until rice is room temperature and texture changes to thick and sticky, be gentle as you don't want to crush the grains. Place the nori onto a bamboo sushi rolling mat, shiny side down. Keep a bowl of cold water mixed with some rice vinegar nearby. Wet your hands in this. Place half the rice onto the mat going right to the end closest to you and leaving about and inch and a half bare at the other end. Press down with damp hands until evenly spread out then gently press down all over till nice and even. Sprinkle with the black sesame seeds then lay down the avocado and carrot sticks a little off centre. Using the mat, roll up, holding down fairly firmly, when you get to the end, wet the bare part of the nori with the vinegar water and finish rolling. Unroll the bamboo mat, transfer the 'log' to a cutting board and using a sharp, serrated knife that you've dipped in the vinegar water cut into 6 even pieces. Repeat with the other sheet of nori and leftover rice. Serve with wasabi, soy sauce and gari (pickled ginger). Any filling can be put in of course, cucumber being very good and traditional. Heat the soy milk in a saucepan until it just starts to simmer, turn off heat and let cool while you melt the chocolate. Place the chocolate chips in a bowl and place over a pan of simmering water, stir until all melted. Place everything into a blender and whizz very well until all smooth - I probably did this for about 5 minutes, you don't want any chunks of tofu in this! If you have to, stop now and again to scrape down sides with a rubber spatula. Spoon into 3 serving cups or bowl or put it all into one larger bowl and put into the fridge until set. One more thing - before you chill this and it's still a bit warm it can taste a little 'soya' like, don't worry! When it chills no one, and I mean no one would know this is made from tofu! !